Great-looking mini GS that’s not at all bad for what it is, but don’t kid yourself it’s anything other than a 30-hp road-bike motor packed into a 170-kilo bike. Note: this was a brand new bike but with several non-standard mods. More below. • Yes it’s 169kg wet (claimed) but like a GS12, it carries it well. Note this recall: dodgy sidestand. Followed by owners’ comments. 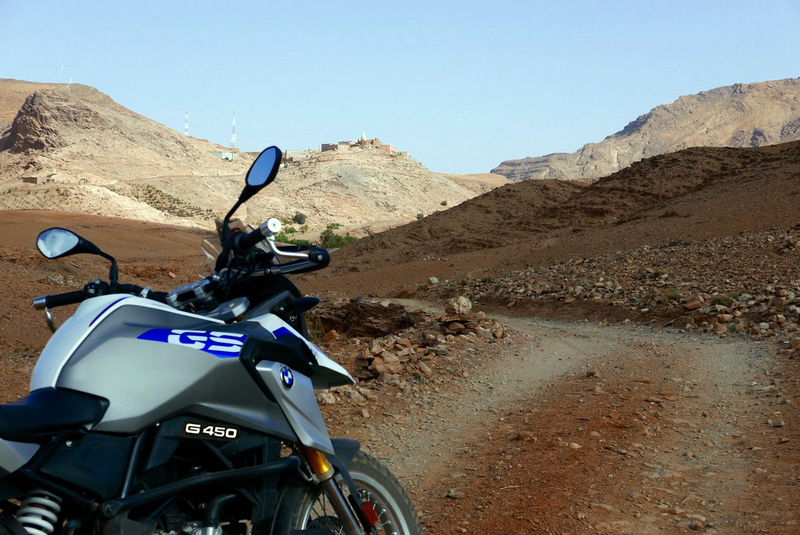 In Morocco Honda XR250 Tornado imports stopped a couple of years back and the Marrakech rental agency I use for my fly-in tours is finally replacing their weary 7-year old XRs with the BMW G310GS. 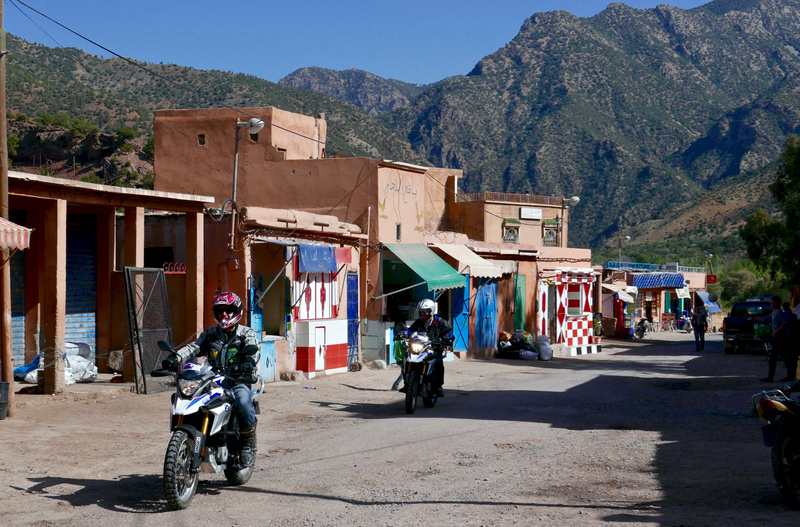 Honda’s newer CRF250L had been a contender too, but Honda Morocco don’t list it. As it is, the 310s suit the agency’s BMW profile and their brilliant, unkillable Tornados, some with over 100,000km on the clock, have paid for themselves many times over. 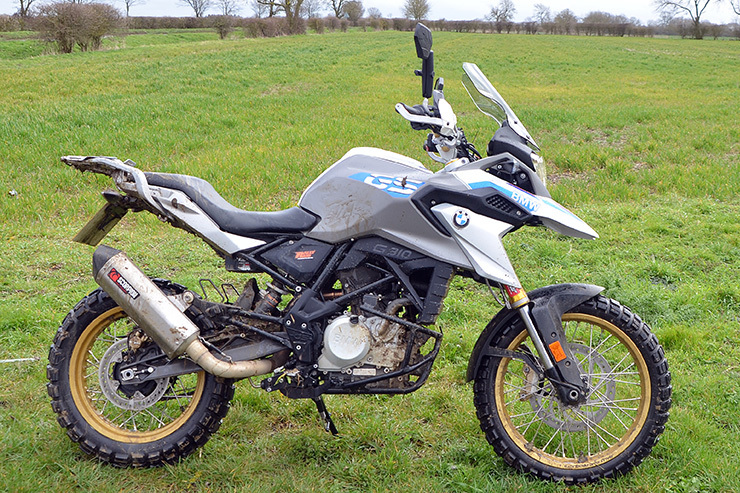 It will be interesting to see if the 310GS stand up as well and for as long. I flew out for three days with two mates, both experienced desert and overland riders. At the end of it neither were that excited by the 310; it’s a big bike with a small engine. I myself was pleasantly surprised. 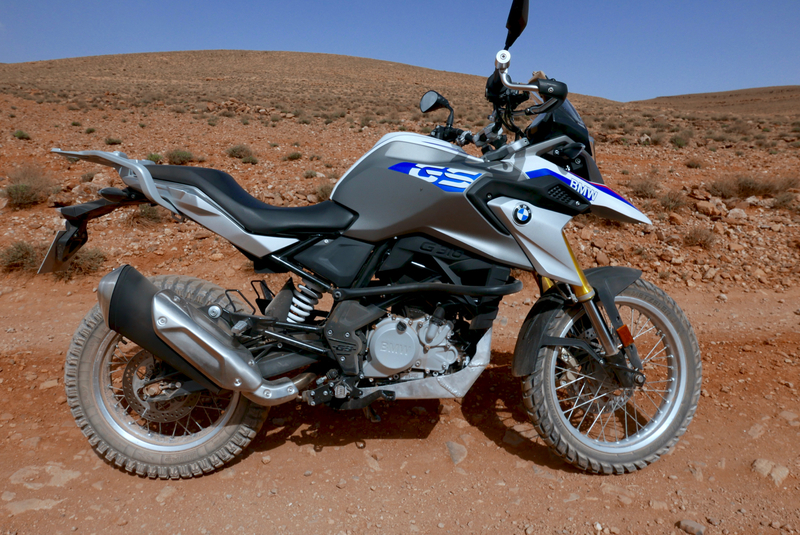 Officially, BMW claim the 310GS makes 34hp at 9500rpm. 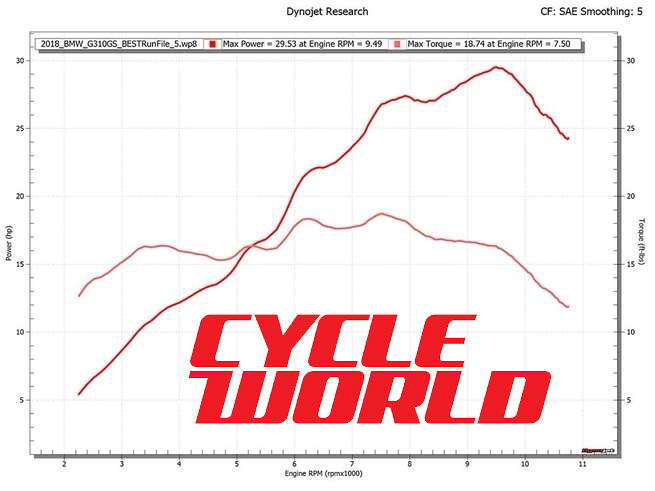 An independent dyno run here shows it’s more like 30hp and Cycle World got a similar figure (left). No great surprise there; most official manufacturers’ figures are optimised. 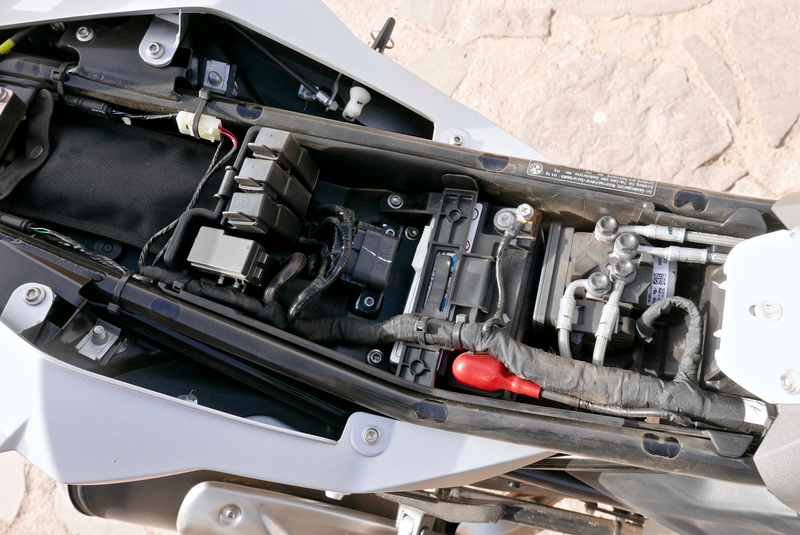 Although the bike doesn’t feel that heavy once on the move, the additional 20% of power over a regular 250 is negated by a similar weight gain adding up to a claimed 169kg. Coming down the twisty R203 back to Marrakech, the old Tornado (135kg) could just about keep up. Climbing up to the pass it struggled, especially once the carb started choking on the elevation. I never revved the 310 over 5-6000rpm, nor really needed or wanted to; the efi helps it pull smoothly but above 6000 it all got unpleasantly buzzy. And yet, according to the Cycle World power graph it’s only making 20hp at 6000rpm after which the extra 10hp pile in. Even then, I suspect that like any bike this size, riding across Spain on a mission to Morocco wouldn’t be much fun. Brakes were great as you’d expect. On the dirt it was the weight and suspension which held us back alongside the XR, and on road or trail I tend not to brake hard to maintain momentum. I forced the ABS on a couple of times to see how it responded and, with no frights, was happy to leave it on. Overall it’s a huge potential benefit, especially on the front. The slightly notchy gearbox I can forgive at such low mileage, but the occasional stalling on pulling away or at low rpm was irritating and I read is not unique to our two GSs. It’s possibly a gutless, negligible-flywheel small-bike knack to overcome with experience and more rpm. Cutting out as I tried to ease round a steep hairpin without feathering the clutch nearly tipped me over. You’d hope a remap at a service may iron this out. Over three fill ups my 310 averaged 88 mpg/73.2 US – 31.3kpl – 3.21L/100k. The official BMW website claims 3.33L/100km (94mpg) which like the hp, also sounds massaged. Still, that was some 20% more than the 88,000-km old XR which, with the same sized 11-litre tank, completed a 230km loop on fumes. Meanwhile, it looked like the 310 was good for at least 300km at that consumption. But – I hardly ever exceeded 90kph (56mph) at which point the vibes set in. As I often observe with these small-bike mpg comparisons, if I rode a bigger bike like my XSR and especially the ultra frugal CB500X RR at such modest speeds, I bet (in fact, I have) got similar fuel mileage, but with the benefit of proper overtaking and cruising speeds when wanted or needed. It’s possible of course that the mileage could improve as the bike runs in, and that our lowered 21/25 psi tyre pressures didn’t help efficiency. Looking the new bike over, there’s nothing glaringly cheap or shoddy to suggest this bike is made in the same place they build Enfield Bullets. 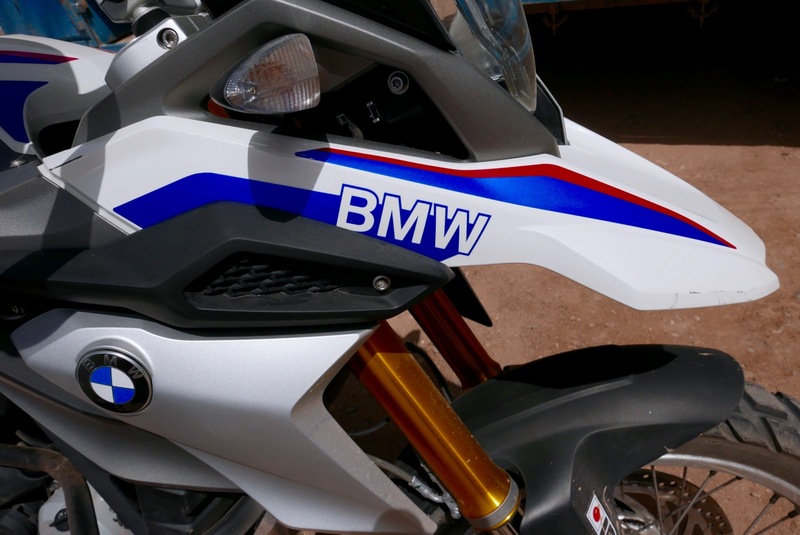 Paint, welds, plastics, assembly and finish all look well up to BMW’s standards. That may all change after a few months rental use. 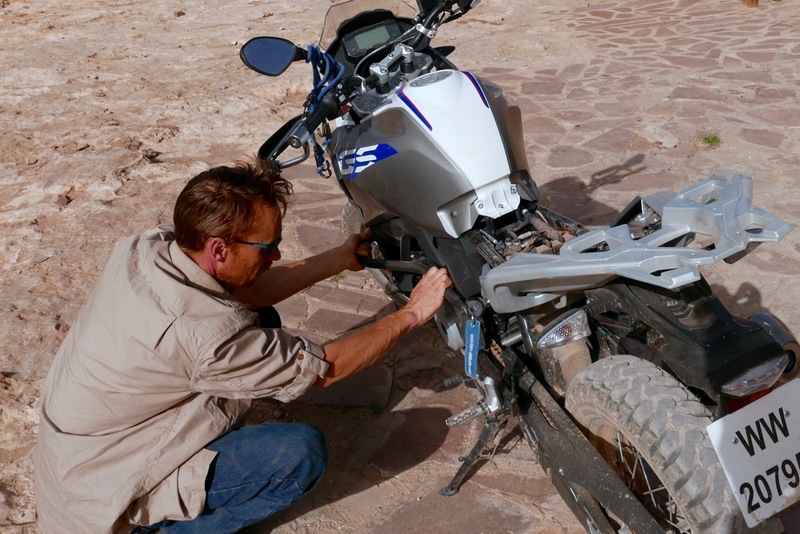 At the end of the first day’s piste bashing we thumped and waggled various bits to make sure nothing had come loose or broken, but apart from the fender and non-stock crash bar or bashplate clanking, all looked in order. Unde r the seat was a handbook in Turkish and a near-proper toolkit which included spindle spanners (won’t fit the new spoke wheel nuts) and a C-spanner for the shock. And for load-carrying duties the rear subframe looked a lot more chunky than what you’d find on a CRF250L for example. I was pleasantly surprised or should I say relieved by the springing. Weighing 92kg (Simon is nearer 70kg), I was expecting the hefty GS with 180mm/7 inches of travel to cripple me on the dirt- or on broken roads. The 310 was certainly slower on the dirt than the clapped-out XR, but road or trail the spring rates and suspension damping felt unusually good compared to cheaply sprung Jap bikes like my XSR before I did it up. Like any big or modestly sprung bike, as long as you progressed smoothly, rough roads and trails were fine. On our bikes the front fender pushed against the DIY engine crash bar and somehow rubbed on the tyre knobs underneath (you can hear it in the video above at 2:48). They ought to fix that before the fender cracks. If I owned a G310GS I’d fit some firmer forks springs and consider a shock spring, but it’s a relief to have half-decent suspension out of the crate, as I recalled on the F650GS SE from 2012. The USD forks aren’t adjustable but USDs usually have better action than conventional forks; the back shock can be cranked with a C-spanner once you remove the LHS side panel. We thought about it but didn’t bother. 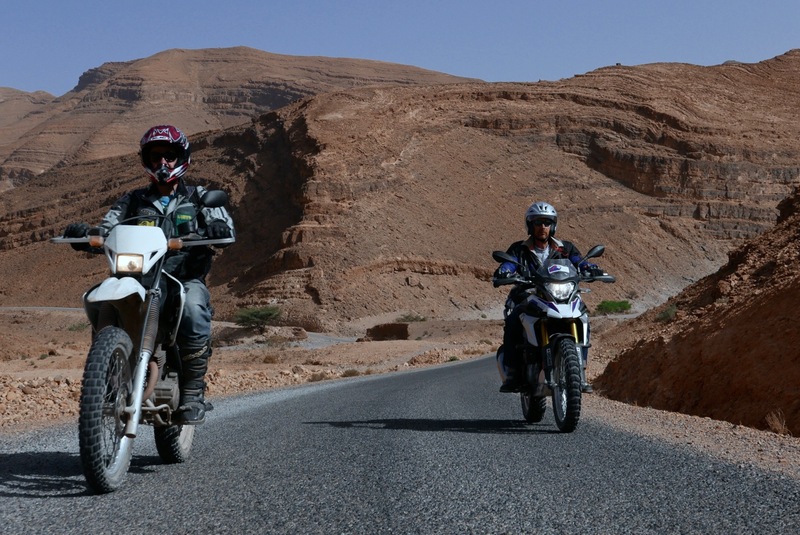 Following their deservedly successful Honda CB500X RR conversion which I also used in Morocco, Rally Raid have developed a similar kit for the G310GS in their quest for supporting smaller machines to use as real-world, all-road travel bikes. 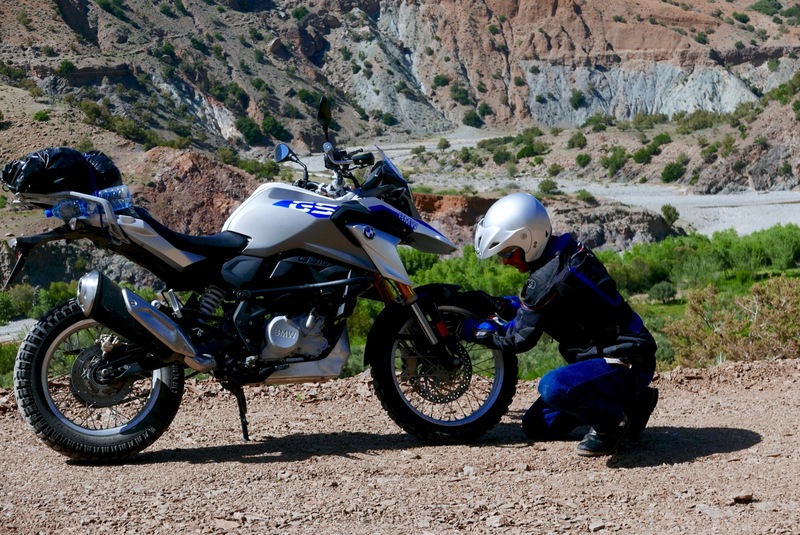 I’ve not seen, far less ridden this bike but there’s a lengthy development thread on the advrider vendor forum, and on the same website Jenny Morgan has just set off to ride a new 310GS RR along the Trans America Trail, as she did with a CB500X RR a couple of years back. Nathan Millward tries one out here for Bennetts Bike Social (right). 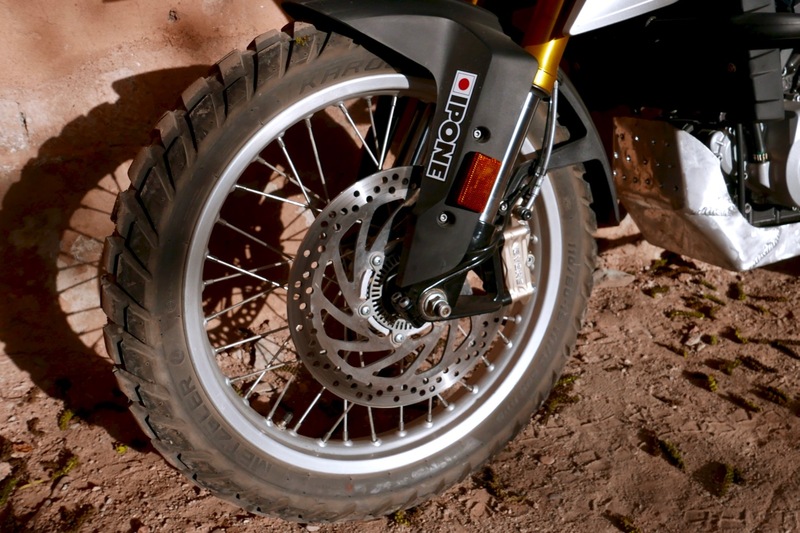 Rally Raid’s kit replicates some of what Loc2roues have done to the 310s we rode: proper bash plate and engine guard, hand guards, tail rack, all-road tyres and a conversion to spoked wheels. 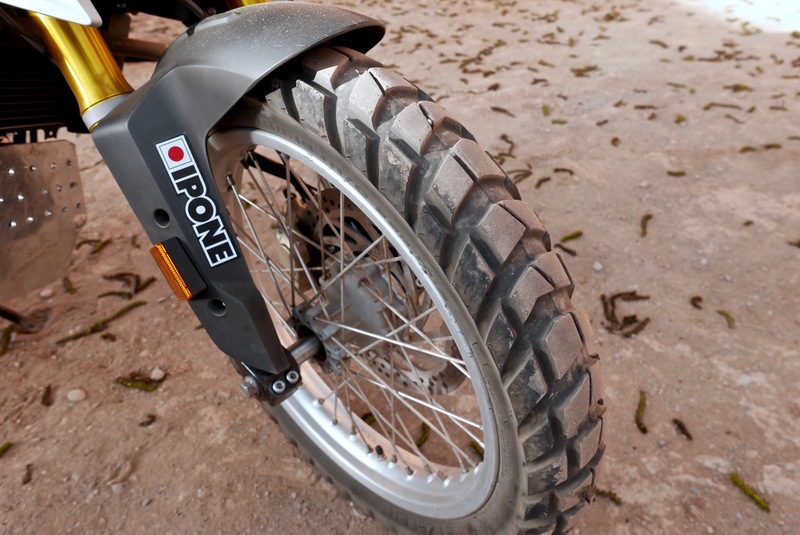 IMO this last modification is redundant on a road-oriented travel bike – this isn’t a WR250 – but at least Rally Raid offer to make the spoked wheels (1150g lighter up front; 2kg heavier at the back) tubeless which is a real benefit on the road. 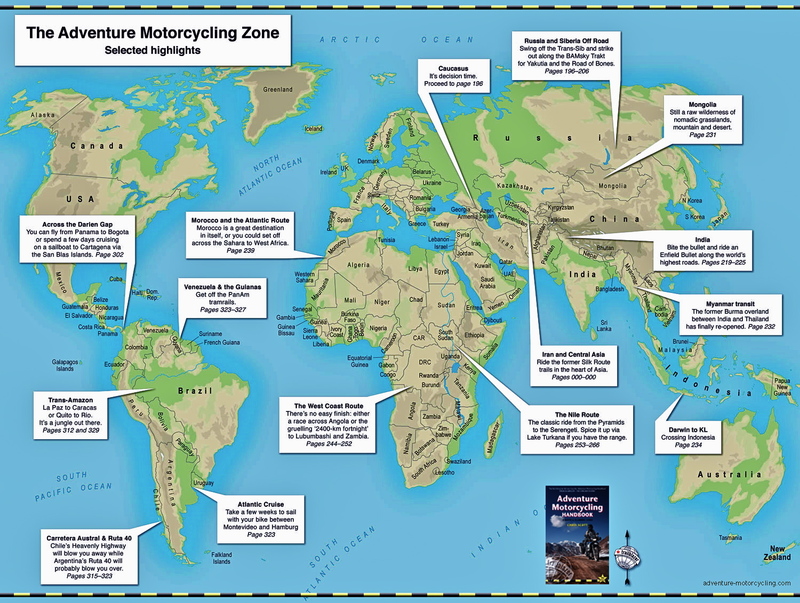 Beyond that, Rally Raid will do you a taller screen, suspension improvements, swaps and height increases, bar risers, lighter pipes and other accessories, but I see no wider footrests listed, nor a seat. I’d imagine they’ll get round to those. You could spend over two grand to end up with a slightly heavier but much more functional bike that still only makes 30-hp. But heck, it sure looks good and the suspension upgrades ought to eat up the trails. Coming back over the High Atlas with the tyres back at 2 bar (BMW manual recommends a rather low 1.7-1.9 bar), me ‘broken in’ to the machine and in a bit of a rush to catch the plane, the 310 swung effortlessly through the hundreds of bends up and down the R203 Test n Test road. Along with me knowing this road well, great ABS brakes the now worn-in new Karoo 3 tyre on a 19-inch wheel all helped with stability and confidence to make the GS fun to ride. But on a flat straight road and reluctant to cane the new engine, the 310 feels little better than a 250, albeit still adequate for the quiet Moroccan backroads. Initially the bike’s bulk can trick your brain into thinking you’re on a 650 until you try and nip past something. This is to be expected with any bike of this size and weight, but at 90kph the usefully wide mirrors blurred and the motor got unpleasantly buzzy. Top speed they say is 144kph/89mph but at the speeds we rode, the handling and brakes have little danger of being outrun by the engine’s performance; ideal for inexperienced riders, especially in wet conditions or on the dirt. The seating position feels natural; for once I’m not cramped nor look it. But it took just a couple of minutes out of Marrakech to notice the thin and soft padding of the 835mm/33″ seat. I thought it might be a thinner, lowered option but was told it was standard. This was by far the worse thing on the 310, recalling my agony on the F650GS SE I rode here a few years back. Add the big step and it means you can’t slide back. As mentioned, the vibes over 6000rpm (about 100kph) make it uncomfortable to travel above this speed, but the vibes may fade with some miles or the engine smooth out at higher rpm. You sit fairly far back; the tiny screen was too short to be effective, although if crouched right down I could just get under the vented wind blast. Taller screens will be an easy fitment. I didn’t meddle much with the modes of the LCD display whose digits I found a bit thin or too small to read in bright sunshine, but all the basic functions are there, hopefully including the ability to swap between kph and mph when abroad. Swapping with the MTB-like XR on the trail, you notice straight away how much more slowly and carefully you need to pilot the 310. That’s to be expected for what it is (I keep saying this! ), but it was still possible to roll along smoothly thanks to the efi, suspension and general layout (dropping the tyres to 21/25 definitely helped). The suspension never bottomed out hard, not did the ally bashplate clang on anything other than kicked-up stones or the engine. Even without risers I (6′ 1″) could stand up with only a small stoop (above left), but after a while the narrow pegs became uncomfortable, even on my off-road boots, compelling me to sit back down. 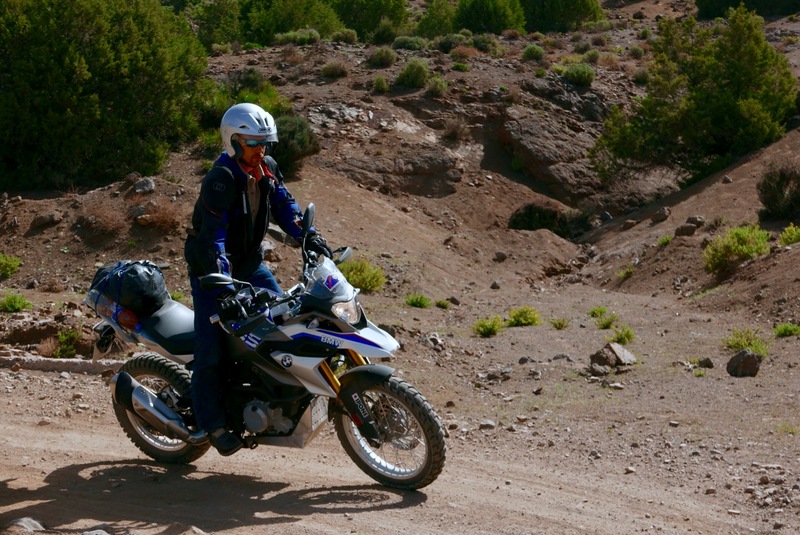 On the slow, rough track up to the 2200-m Tizi n Oumerzi pass the other two said the fans kicked in and the bikes were hard work, but when I took over on the smoother descent the 310 was great fun – to be honest like any adv bike, large or small. (With ambient temperatures up to 34°C, I myself never heard the fan come on. You wonder if the reversed engine – exhaust pipe at the back – may help keep the radiator cool). This new-ish 300-cc category is a bit obscure in the UK and much of the developed world; offering little extra over the well-established and huge selection of 250s. Elsewhere class or power categories may be different and must be where the main market for this bike lies (in India it costs about £3260). Before I rode it I assumed that the G310GS would be poor compromise for my sort of riding: too heavy and road-oriented for off-road exploring beyond smooth gravel tracks (like my current XScrambleR), but too underpowered on the open road in the face of hills, headwinds, traffic and payloads unless you cane the nuts off it (like last year’s WR250R). 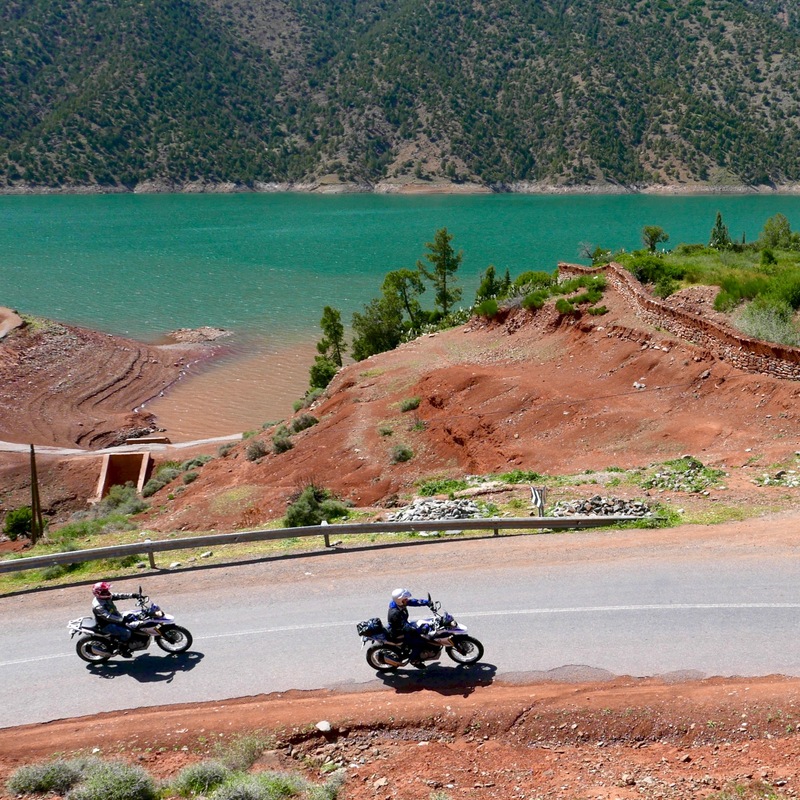 This may be so but in Morocco the GS felt right in its element. The easy trails and quiet, sub-100kph backroads suited the 310 (or any ‘250’, tbh). That ought to translate to a good small RTW travel bike where the last thing you actually need is a quarter-ton, 140-hp behemoth. But I’ve found choosing a bike with this little power depends a lot on your weight (if not your size), the load carried and your expectations. When overlanders settle for the clear-cut limitations of a 250 they hope to gain a more manageable machine off-road. You wont get that with the 310. For my one-week tours it’ll probably be more suited to experienced riders comfortable with its weight and bulk on the dirt; the lowish seat helps here over the annoyingly tall XR. 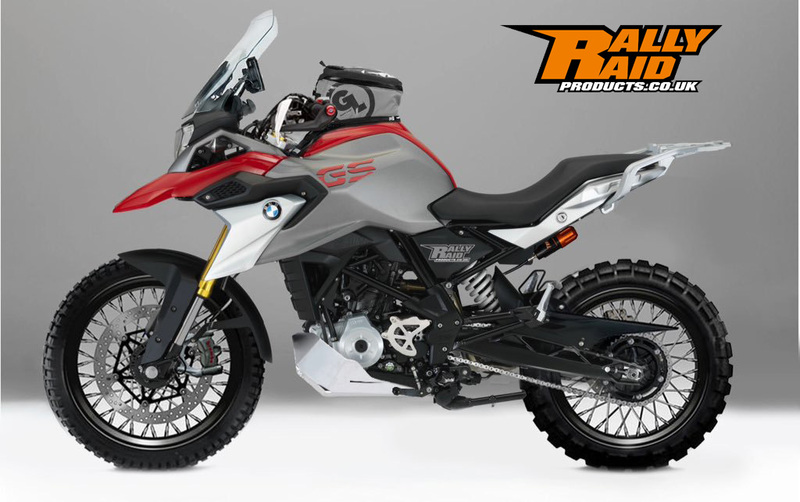 So if you’ve owned a lot of bikes, large and small, the 310GS isn’t such an exciting proposition, but I’m sure its great looks, price, spec and bulk will lure newer, younger riders into the all-conquering Cult of GS. 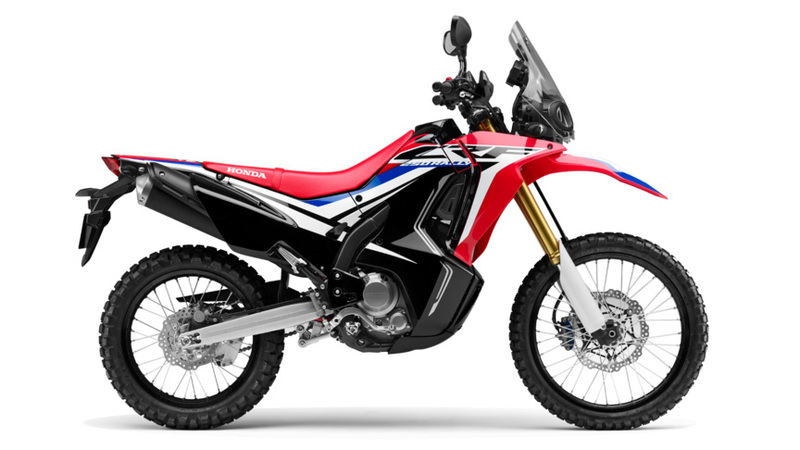 Otherwise, at about the same price Honda’s CRF250L Rally (right) might be worth a look: 13 kilos lighter, better protection and the similarly great looks which these image-conscious millennial demand. And it’ll surely be more nimble on the dirt. 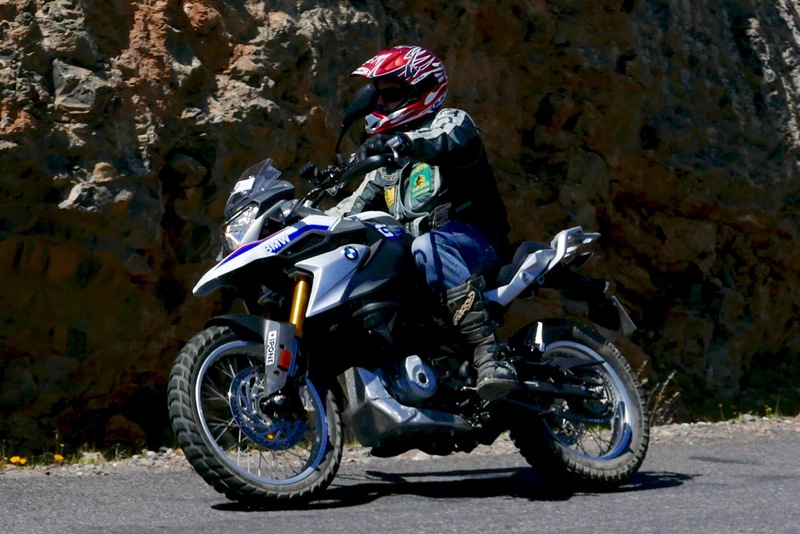 Now a G450GS that was no heavier – that could be an interesting machine for more mature riders and which might prove be worth developing into a do-it-all travel bike. We got a plane to catch! 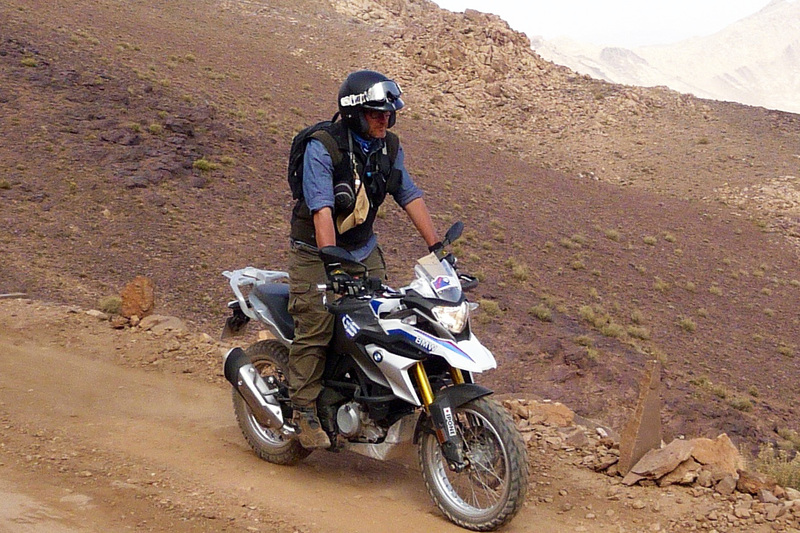 This entry was posted in AMH News, BMW G310GS and tagged BMW G310GS, G310 GS, Morocco. Bookmark the permalink. I see that you state having G650GS spoked wheels mounted on the 310. Were these a direct bolt on or did they require modification? Hi Sean. Definitely not a straight swap – it very rarely is. There was a big disc spacer on the front (same as my XSR) and probably more complicated spacing on the back. Thanks for the info! 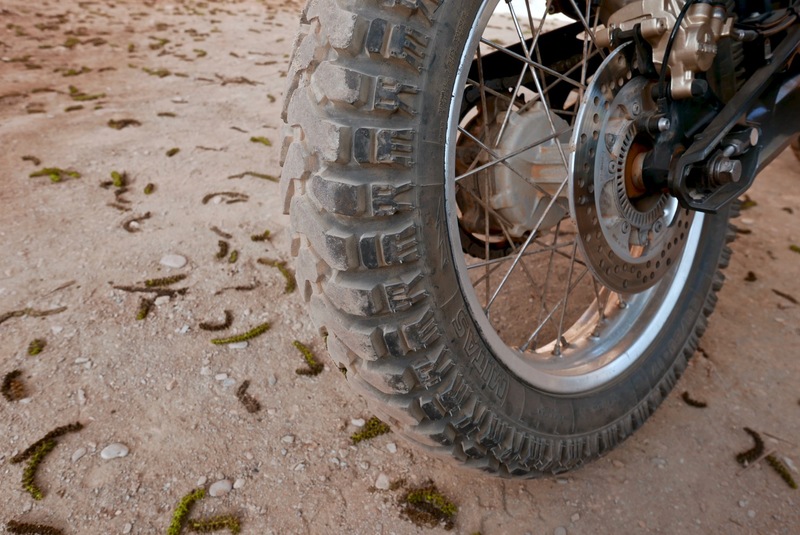 Was hoping to find a way to swap some spoked wheels without having to wait for rally raid’s production to catch up. comparing the G650XCO and the new G310 GS which in Your opinion is better all rounder? Obviously I’m not asking about the power difference which is obvious (and big), but other factors such as handling, weight balance etc. Which one You’d recommend to the less experienced driver? Amazingly the XCo is lighter and if you can find a good one and have no license restrictions, I would say go for that. If you get a 310 as a road bike it won’t take long to get used- or even bored with it. It will only be a stepping stone towards a proper bike. For me the only reason to get a ‘250-ish’ bike are the benefits of light weight off road. Others obviously manage but on the road I find them on the limit. A 450 could be perfect. Sorry, only just seen this. I would not classify the 310 as a dual sport. My previous 250s were all much more fun and effective on the dirt and a bit more of a slog on the road. The 310 is definitely a road bike in the street scrambler mould that does OK on the dirt.